We left Panama City by plane from the small and chaotic Albrook airport, and arrived at the even smaller Bocas del Toro airport, where kids were playing soccer at the end of the runway. We were picked up and taken to our charming guesthouse, Bahia del Sol where we have a two bedroom suite with a large balcony. Our hosts are really nice and told us a lot about the area and what to see and do. After a couple of beers at the public patio, watching the sunset, we took a taxi to the city center and had a great dinner (ceviche and tuna) at El Ultimo Refugio Restaurant. The next morning we got up early, had a big breakfast and got ready for a full day boat ride around the islands together with some of the other guests at the guesthouse (a Canadian couple, a Finnish couple on their honeymoon and an american girl. All great people!). The boat picked us up at the patio and took us to Dolphin Bay where several very large dolphins where playing around. 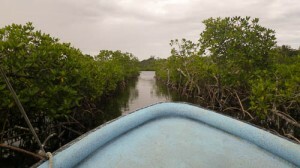 After navigating through narrow canals between the mangrove islets we snorkeled for one hour in Coral Cay just off Isla Bastimentos. We also had lunch at a famous local restaurant built over the sea there. 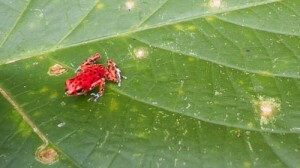 The tour continued to a bay where we saw several sloths in the trees, and finally we spent a couple of hours at Red Frog Beach, named after the red poison dart frogs that live in the forests by the beach. In the evening we went to a cozy wine bar overlooking the main street and the bay with Kim, the American girl from the boat ride. We spent the evening drinking wine, sharing travelling experiences and watching the street life. She was leaving the next day, so we had a goodbye-beer on our balcony before going to bed.